This Cal-Mil 677 bottle organizer is the perfect addition to your coffee shop, cafe, restaurant, or bar! Its step-style, 3 tier design makes bottles easily accessible and identifiable in your fast-paced venue. This organizer has 6 separate holes for neatly storing and displaying your syrup bottles. Made of extremely durable acrylic, this unit is built to last and its sleek black color will complement any decor. The hollow interior also reduces the overall weight, making it more manageable without sacrificing durability. Plus, its easy-to-clean surface allows your employees to quickly wipe this organizer down, maintaining your sanitary, inviting environment. 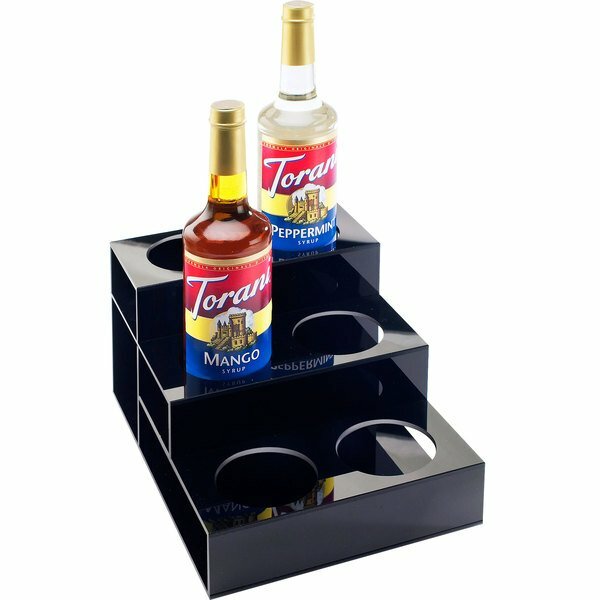 Overall User Rating: Cal-Mil 677 Black Acrylic 3 Tier Bottle Organizer - 9 1/2" x 12 3/4" x 6 1/2"
I dropped the organizer and the back cracked, but with a little tape, it is still sturdy.Overall, it does what it says and holds all the syrups nicely.